The polarization properties of glycerol-like highly viscous liquids are elucidated in this work. The specific features of their behavior is due to the existence of clusters, the specific volume of which grows with decreasing temperature. The bulk dielectric permeability of clusters differs significantly from the dielectric permeability of the surrounding liquid, a condition caused by the distinction of orientational ordering of molecules in them. A general method of calculation of dielectric permeability of spatially inhomogeneous systems in the volume and in the surface layer is proposed. Concrete calculations are carried out. The problem of dielectric permeability of thin “monocluster” films of highly viscous liquids is considered. 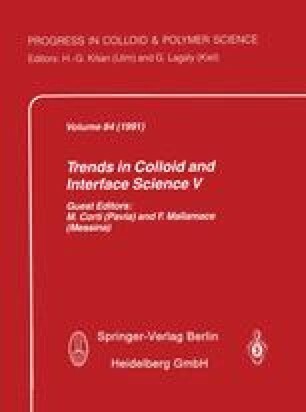 The influence of the clusterization of the highly viscous liquids’ supercooled states on the character of transmission and scattering of electromagnetic radiation is discussed.